With 2 of our 3 directors living in Greenwich, it’s only right that’s what we consider to be the Confetti & Silk base. Nothing is easier than having local suppliers film your Greenwich wedding video. Originally referred to as the Green wic (meaning port) the history of boats and all things naval are set in stone for the area. 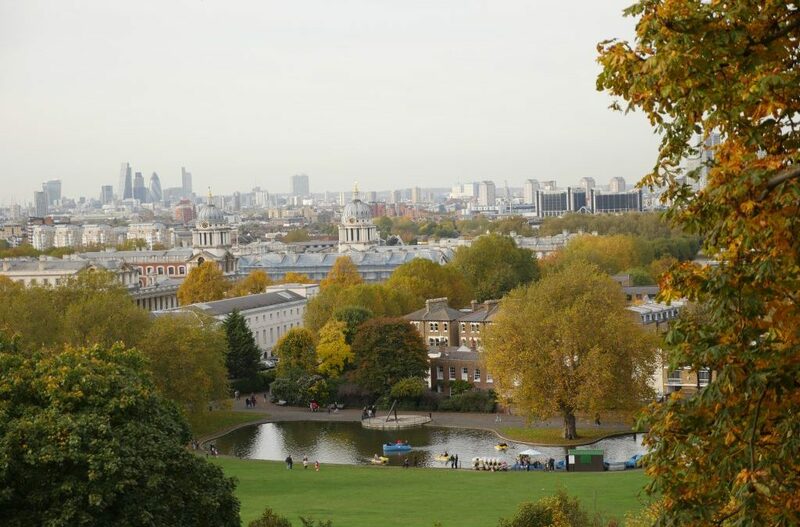 The park, which has seen us film many a sunset from as well as run multiple laps around on a failing fitness regime, dates to 1433 with the observatory built in 1675. If I was paying attention properly around the British museums clock exhibition I once went to- Greenwich Meantime originates there as it was the place of the most accurate clock in the land at one time. Fastforward a few centuries and we’ve now got my favourite London brewery, Meantime, pouring London Lager founded in 2000 by Alastair Hook. 4 beers ranked in the ‘worlds best 50 beers’ is testament I’m not the only one glad to have found the brand. My favourite place to sit with a glass of said lager is in the Old Royal Naval College, the architectural masterpiece of Greenwich and just a stones throw from the most iconic wedding venue in Greenwich- The Painted Hall and the riverside pub with the grandest windows next to the water- The Trafalgar Tavern. A Greenwich wedding video can also have the benefit of incorporating the rive Thames in it, and nowhere moreso than at the Trafalgar Tavern. Having become the preffered wedding videographers at the Trafalgar Tavern we were eager to find out a bit more about its wedding offerings. Weddings take place upstairs in the Nelson banqueting room which look out over the Thames. Dark wooden floors, elevated ceilings and chandeliers work beautifully with your own private bar next door named the Admirals Gallery bar and can cater for upto 200 guests. Some opt to get married in the Nelson room whilst others use it for reception only. Either way we are looking forward to shooting there during 2017. Painted at the start of the 1700s by Sir James Thornhill taking 19 years to complete- yes 19, the hall has been opened to visitors since 2002. The upper hall has already been conserved and the lower hall is now being painstakingly worked on to preserve it for many future generations. From a wedding perspective this unfortunately means the main hall will be closed to weddings in 2017, however the more intimate Admirals house and Queen Mary Undercroft will remain for wedding hire during this time. Described in newspaper articles as ‘the finest dining hall in Europe’ there is no mistaking how incredible a wedding in the Painted Hall can be. A nautical theme runs throughout many weddings in Greenwich and here it is no different, there are many references to Birtish navalry in the painted images themselves depicting their importance in forming the foundations for the Britain we know today. The pillars create symetry- great for taking incredible wedding images with. Imagine being a bride and making your walk down the aisle in the midst of such grandure and sophistication, with all eyes in awe and on you for your special day. Truly spectacular. With the stunning architecture and grounds as backdrops during your wedding, as well as a picturesque part of the River Thames, a wedding film just might turn out to be one of the best wedding films we’ve ever shot here and we can’t wait to get the chance to work with some wonderful couples here at our most local of all London wedding venues – it’s less than 3 minutes from our front door afterall. Where Henry VIII was baptised, the Grade 1 listed building forms part of the Maritime Greenwich World Heritage Site. What we would class as a perfect sized church. Not obscenely big so that you look like you have no friends when you only fill it a quarter. But a nice intimate atmosphere whilst still spacious. We shot here for another wedding film studio in summer 2016 and enjoyed it. A welcoming vicar who allowed us to capture our video however we liked. You can watch our solo shot Greenwich wedding video from St Alfges and Charlton House on our Youtube channel here. Wherever you are getting married in Greenwich we hope to work with you to create the best, and most local, wedding film of your day possible.